Cocktail enthusiasts in the Valley have a place to call their own, now that Black Market Liquor Bar has opened in the former Wine Bistro space in Studio City. Cocktailians on the other side of the hill will want to make the pilgrimage to Black Market as well, thanks to a stellar drink menu created by Pablo Moix and Steve Livigni (Harvard & Stone, La Descarga). Moix and Livigni’s involvement with Black Market came about after persistent overtures from owners Mario Guddemi and Sal Aurora of The Happy Ending in Hollywood. 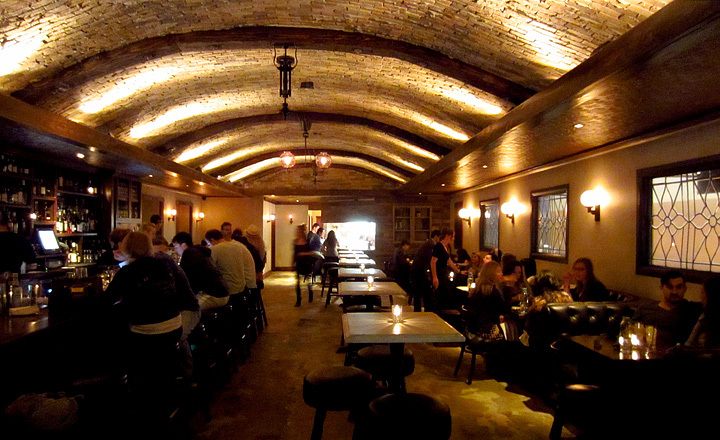 After some discussion as to what it wouldn’t be, Black Market was simply conceived as a neighborhood bar with cocktails created by Moix and Livigni. 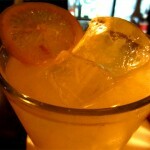 Once the idea to do food was broached, it was agreed that Black Market would feature a sophisticated menu to pair with the cocktails. During the team’s search for a chef, Moix overheard a conversation about Antonia Lofaso, who was competing in Top Chef All-Stars at the time. Moix already knew Lofaso, the call was made, and Black Market had its chef. Of course, if Black Market was going to have great cocktails and food, it followed that the beer and wine lists would have to match. With that in mind, certified cicerone Jace Milstead was tapped to curate Black Market’s rotating craft beer list, while Sally Kim (Terroni) is the sommelier. Black Market had a formidable team behind the stick for Monday night’s grand opening, including Mia Sarazen, Lacey Murillo, Tricia Alley and Ray Ewers. Sarazen and Murillo are still at Harvard & Stone and 1886, respectively; Valley imbibers can now stay local and enjoy their drinks at Black Market. Alley and Ewers, both formerly of Providence and more recently at B-Side, are at Black Market full time. Moix had long wanted to find a spot for Ewers at one of his bars, and is particularly excited about having him at Black Market. Moix will likewise be at Black Market every day, while Livigni has apparently perfected some kind of cloning technology and will be at the various bars the duo has recently opened, in addition to working on the August opening of Pour Vous. 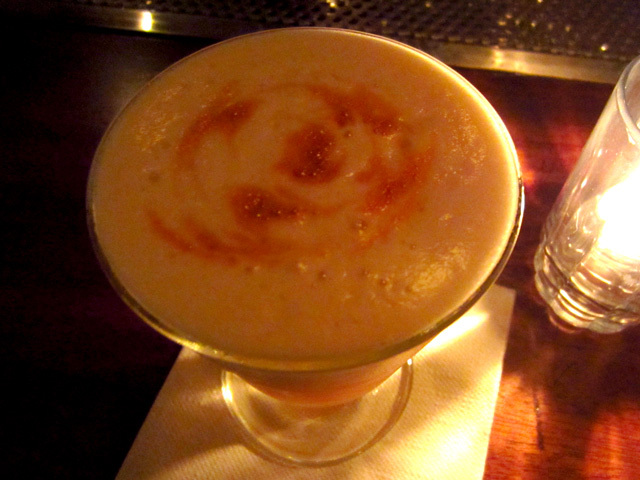 Sarazen started me off with a Boulevard Sour: rye, Cynar, lemon, sugar, egg white and Angostura Bitters. It doesn’t matter what area code you’re in when Sarazen is mixing your drink, it’s guaranteed you’re going to get an excellent cocktail. Case in point was this sour, nicely balanced between sweet and spicy, tart and bitter; a perfect sipper whilst I got acquainted with Black Market. Livigni said that, other than the windows, there isn’t a square inch of the interior that hasn’t been updated from its previous incarnation. 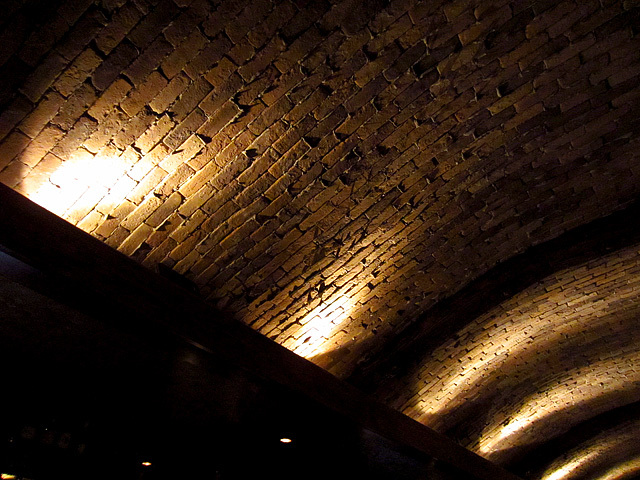 The gentle slope of the barrel vault brick ceiling is what most guests will notice first. A close second would be the multi-tiered back bar, which Moix said was custom-built around the height of the bottles. Groups can settle into old school black booths across from the bar, while couples can opt for one of the high square pedestal tables along the length of the room. At the far end of the space is the open kitchen, where guests can sit right in front of Lofaso as she expedites orders. Back at the bar, the pace had started to pick up. The City Fizz (gin, lime, cucumber, mint, egg white, absinthe), Amber and Embers (Laphroaig, Clement sugar cane syrup, Angostura Bitters, Regan’s Orange Bitters), and Punch for One (Encanto Pisco, pineapple, agave, Angostura, lime) were all getting lots of love from fellow bar patrons. Next up was the superb Smokin’ Monk: Del Maguey Mezcal Vida, yellow chartreuse, lemon juice, orange juice and a barspoon of sugar. When Moix took a sip of my neighbor’s Smokin’ Monk, he exclaimed: “This is EXACTLY how it should taste!” Then he tried mine, and said the same thing. What did I say about Sarazen? 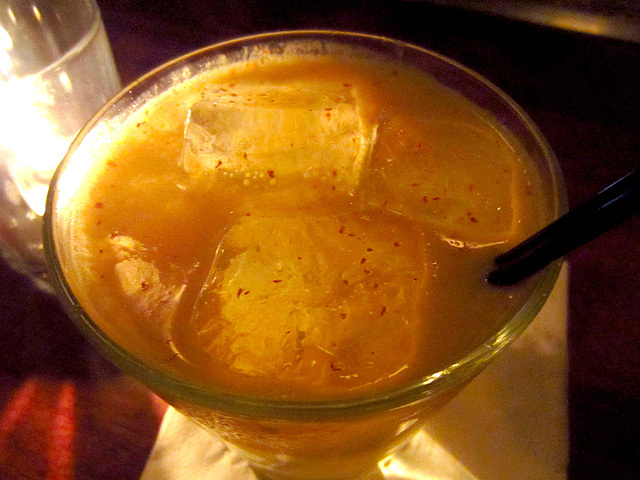 Not to be outdone was Murillo, who did the honors for my final round, the Fields of Gold: bourbon, lemon, orange juice, orgeat and freshly grated cinnamon. Summer is nearly here, but in the midst of June Gloom the Fields of Gold is a welcome taste of the fall. 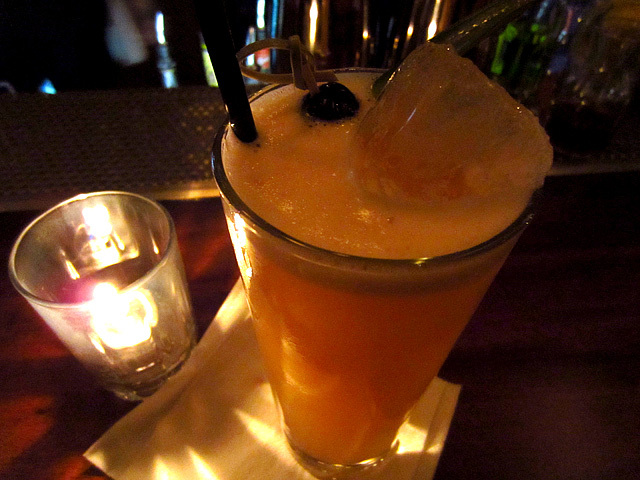 And Murillo’s cocktail was a testament to the expertise that will be working the Black Market bar on any given night. Even though it was the first night of full service, the lively crowd and top notch drinks gave Black Market Liquor Bar the vibe of a neighborhood gem that’s been there for years. Moix noted that the opening menu is only a sampling: over thirty cocktails will eventually be featured, mostly original creations plus a few classics. 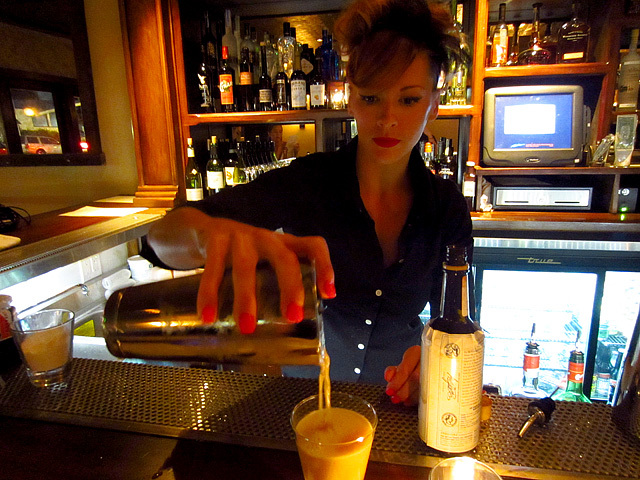 With so many cocktails to explore, as well as Lofaso’s menu and its beer and wine offerings, Black Market is a welcome addition to the rapidly expanding list of L.A.’s craft cocktail destinations. 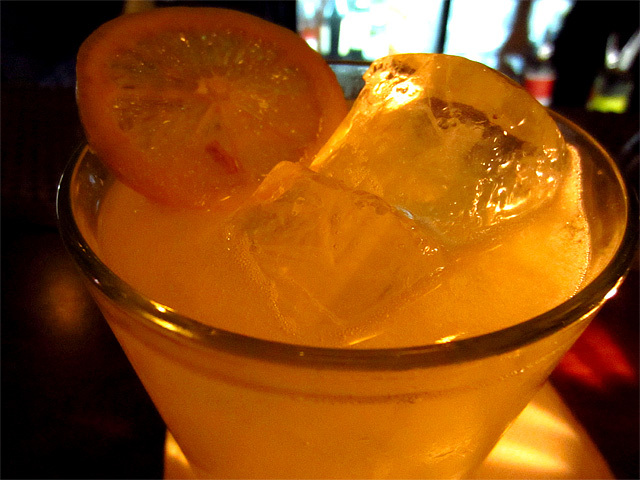 Black Market Liquor Bar is open every day at 5pm.